The year is 1868, and a French scientist by the name of Leopold Trouvelot has just accidentally released an organism that will ruthlessly defoliate trees of Massachusetts forests in the years to come (DEEP, 2018). This disastrous creature is none other that the Gypsy moth; a species of moth which has been living and thriving in European and Asian ecosystems for thousands of years (Libehold, 2018). It took this moth ten years prior to establishment to reach a population level that was sizable enough to notice (Libehold, 2018). Within 100 years, this moth had spread from the point of origin in Boston to areas all throughout the northeast coast, into the great lake states, and even into further northern areas such as Quebec and Ontario (DEEP, 2018). This rapid expansion was fueled by the vast amount of plant species the moth is able to feed upon and the limited predator it had. As stated previously, this species of moth originated in European and Asian areas, and was brought to the United States (Libehold, 2018). This classifies the gypsy moth as an invasive species, or “a non-native organism which can cause economic and environmental harm or harm to human health” (Center, N. I. 2016). Since the gypsy moth is not native to North America it has very few natural predators, and a vast pool of susceptible plant species to feed on. The combination of these two factors had led to this organism’s success in areas such as Massachusetts, where it is able to feed on and defoliate tree leaves on a mass scale. Since the United States gypsy moth outbreak began in Massachusetts, this makes it an important area to analyze in order to understand how this moth is affecting United states forest ecosystems as a whole. Gypsy moth eggs are laid in the lower forest canopy in clusters of 500 or more, and hatch around May (Eaton et al, 2018). When hatched, the larvae begin feeding on foliage in this lower forest area, or move to higher regions in order to find a more preferred host (Childs, 2018). The gypsy moth is capable of feeding on leaves of over 100 different species of native plants that grow in Massachusetts climates (Libeholds, 2003). They are known to feed primarily on leaves of deciduous tree species but will oftentimes be found feeding on needles coniferous species in the absence of a preferred food source. Of these deciduous trees, the moths primarily prefer oaks and aspens; tree species that dominates many of the northeast’s forests (Eaton et al, 2018). The moth larvae will feed extensively upon the hosts leaves until it has acquired enough energy and biomass to pupate into adults (the adult moth stages do not feed) (Childs, 2018). One major concern for the Massachusetts ecosystem is the fact that gypsy moths decrease the overall health, or ability of a forest to be a “fully functioning community of plants and animals and their physical environment”, of northeast forest systems (Colb, 1995). The gypsy moth disrupts forest health by damaging, and killing many of the plant species that are key components of a functioning system. When gypsy moths feed they are essentially putting major stress on a plant. This stress can lead to eventual death through the depletion of nutrients or through the increased susceptibility to other diseases which cause death (Grupp, 2018). Depending on the size of a population in an area certain plants face the risk of being defoliated up to two times in a growing season (since many plants are able to produce a second set of leaves after the original leaves are all eaten). Several years of heavy defoliation like this can result in levels of plant mortality, observed to be above 20% in some northeast forests (Libehold, 2003). If the defoliation doesn’t kill the plant directly, through severe reduction of nutrients, it will drastically decreases the ability for the plants immune system to fight off pathogens, meaning a high chance of mortality (Pandey et al, 2017). For example take the American chestnut tree. This species already faces the threat of infection due to the fungal disease chestnut blight. When a gypsy moth consumes chestnut leaves, the tree must put energy into re-growing these leaves, meaning less energy into defense against the chestnut blight pathogen (or any other pathogen for that matter). When gypsy moths feed on said trees all the nutrients are being concentrated to regrow lost leaves. This lack of allocation to the trees defense creates an increased susceptibility to the chestnut blight fungus, enabling infection, and resulting in the death of the tree due to fungal infection (Anagostakis et al, 200). The decreases in resources the plant has for fighting off pathogens due to defoliation can drastically increase the amount of death these infectious pathogens cause to current plant species which changes the forest equilibrium, resulting in a decrease of overall forest health. Though gypsy moths threaten the overall health of a forest system, there are specific ecologically important species that are at high risk. 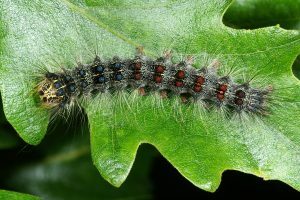 One species of major importance that gypsy moths prefer are a staple of Massachusetts forest ecosystems is the oak tree. These are a species of trees that have a crucial role in the current ecosystem. Oaks provide a significant amount of food for many native fauna species during autumn when the nutritional value of other forrige plants decline (Ober, 2017). Animals such as deer, wild turkey, black bears, and squirrels squirrels all rely on acorns to overcome the upcoming winter (Ober, 2017). Not only do oaks offer food for native animals, they also offer provide shelter. Large dense canopies offer concealment for small animals such as birds,and squirrels from predators, and since oaks are one of the last deciduous trees to drop leaves, many of these species rely on the cover of oaks to stay protected late into fall (Cavender-Bares, 2018). Oak trees also offer a vast amount of environmental protection. The roots of these trees are often deep and high in biomass, helping to stabilize the soil around them, prevent erosion, capture nutrients washed deep into the soil by rainwater, and act as a ground water filter (Ober, 2017). The depletion of these trees due to gypsy moth damage could result in a total dynamic change of Northeast ecosystems. With less oaks dominating the forests, other trees will take their place, ushering a new ecosystem with them. The spread of the gypsy moth to U.S. has created some concerning realities for Massachusetts ecosystems. The fact that this moth has the ability to wipe out a large number of oaks combined with the information that overall forest health is being compromised due to defoliation has worried many. This insect, if left untreated, will eventually cause permanent damage to Massachusetts ecosystems. Given the risk gypsy moths pose to Massachusetts ecosystems through defoliation, and eventual death, there has been a drive in the scientific community to start investigating certain organisms which may have potential to mitigate population sizes of gypsy moths. Gypsy moths pose a pertinent threat to Massachusetts ecosystems, particularly many native tree species, and to help mitigate this threat, the naturally occurring fungus, Entomophaga maimaiga should be used to control the population. E. maimaiga is a fungus native to Japan; the fungus releases spores that attach to gypsy moth larvae. The spores will grow through the exoskeleton, and begin eating away at the insides of the larvae (Michigan State U.). At the same time, the fungus will grow from the inside and once the host dies, the fungus will shoot out more spores into the air, infecting larvae in the area. During winter, the fungus leaves resting spores inside the dead body of a larvae. The cadaver will eventually fall to the ground, and the spores will remain there until conditions become favorable, at which point the spores will be released, infect larvae, and the cycle repeats (Cornell Mushroom Blog). The planned reintroduction of the fungus, Entomophaga maimaiga, into the United States would control the spread of gypsy moth infestations. Nielsen, Keena, and Hajek (2005) performed a study on how different gypsy moth strains reacted to different strains of E. maimaiga. They found that all forms of the fungus were pathogenic to all tested gypsy moth strains (Nielsen et al, 2005). One of the gypsy moth strains tested was from the United States. Depending on the fungus strain, mortality rate ranged from 90% to 100%, and death would occur between 4-5 days after infection (Nielsen et al, 2005). The best performing fungus was the Japanese strain, therefore that is the one that should be used in Massachusetts. E. maimaiga has already been introduced in areas of Europe where gypsy moths are a threat to the ecosystem. In Bulgaria, before the fungus was introduced, gypsy moths would cause between 150,000 and 370,000 hectares of forest damage each year (Zúbrik et al, 2016). A hectare is equivalent to 2.5 acres. Once the fungus was introduced in 1999, forest damage has not gone above 25,000 hectares in any year (Zúbrik et al, 2016). The fungus has also been introduced in Serbia, where it was credited with preventing a gypsy moth infestation in 2011, and in Slovakia; stopping an expected outbreak between 2013 and 2015 (Zúbrik et al, 2018). The fungus has been released in the United States before for Tobin and Hajek’s (2012) study on the rate the fungus spreads after becoming established in an environment. The test was performed on Oak Island in Wisconsin. They found that the fungus can spread at an average rate of 1.3 km/year and a maximum rate of 6.1 km/year (Tobin and Hajek, 2012). According to the Massachusetts Department of Conservation and Recreation, 923,000 acres of defoliation has occurred in the state due to gypsy moths. That is roughly 3735 km sq. of land. If the fungus can spread at at an average rate of 1.3 km/year in any direction, then it can cover a circular area of around 5.31 km sq./year. After 3 years, the fungus will have covered an area of 47.78 km sq. Therefore, if you place the fungus at equidistant locations at 79 different points, the gypsy moth population of Massachusetts would be killed within 3 years. Valenti wrote a journal article about how E. maimaiga affects gypsy moths. In 1996 in outbreak of E. maimaiga in the United States decimated the gypsy moth population as evidenced by a myriad of symptomatic cadavers and a 99.2% reduction in acres defoliated over the previous year. (Valenti, 1998). This was due to the ideal wet and damp conditions in the summer months. This leads us to believe that the best time to release the fungus would be during a warm, wet spring day. There are two different ways to spread the fungus. The first method would be to relocate soil containing E. maimaiga resting spores into an infected area. (Smitley et al.). Once the conditions become suitable, the spores will release from the ground and begin infecting the moth larvae and spreading. Alternatively, the cadaver method, releases infected larvae cadavers onto the tree trunks of a gypsy moth heavy area (Smitely et al,). The larvae will eventually die, and in doing so, will infect other larvae in the proximity with E. maimaiga. Both methods work effectively but, according to Dr. Leah Bauer of the United States Forest Service, the most commonly used one is the cadaver method (personal communication, November 26, 2018). This was the method used in Tobin and Hajek’s (2012) study; 250 infected cadavers were used to introduce the fungus to two Wisconsin islands. Our plan for controlling gypsy moths in Massachusetts starts with pinpointing areas where gypsy moth defoliation is particularly high, and then targeting those areas with E. maimaiga. While E. maimaiga is native to Japan, there are labs in the United States which grow it. Additionally, the fungus is currently used to in the United States to prevent gypsy moths from spreading further west (A. Hajek, personal communication, November 28, 2018). Therefore, cadavers could be collected from from the area or be infect in a lab, and then be transported to gypsy moth areas. While there is currently no price for E. maimaiga, other insect killing fungi such as B. bassiana sell commercially on Amazon for $75/lbs. A similar price point could be expected for E. maimaiga. According to the Department of Conservation and Recreation, the total statewide damage by gypsy moths in 2018 was 159,705 acres of land (Gypsy Moth in Massachusetts). The areas where damage was most prevalent were “Essex, Hampden, Hampshire, Middlesex, Norfolk, Plymouth, and Worcester Counties”. In these areas gypsy moths decimated the tree populations leaving almost no leaves on the branches. Over a few years this destruction will lead to trees dying from lack of nutrient uptake. That is why efforts should be focused on these areas, in order to best control the gypsy moth damage. In these particular areas cadavers will be deposited on tree trunks to infect gypsy moths in that region. Ultimately we decided to help mitigate the threat of gypsy moths on the ecosystem a biological control must be put in place.We believe introducing E. maimaiga would help safely combat this issue. There are many arguments that introducing a biological control to combat a biological problem will fail. For example, in 1986, a species of fly called Compsilura concinnata was released in 30 states with gypsy moth problems, but the fly did not just kill gypsy moths; it was a generalist that attacked at least 180 species of insect. (Jensen, M. N). This wreaked havoc on 30 states ecosystems, decimating many species of moths. However, the fungus E. maimaiga is quite specific to gypsy moths, meaning it will not affect other species in the ecosystem. In Soper, Shimazu, and Humber’s (1988) study, they tested how how different species of insects reacted to the Japanese E. maimaiga strain. They attempted to infect coleoptera (beetles) and orthoptera (crickets and locust) with the fungus and found a 0% infection rate (Soper et al, 1988). The same test was performed on hymenoptera (bees and ants) by J.D. Vandenbergi (1990), and his results were the same. There are 173 coleoptera species, 18 orthoptera species ,and 55 hymenoptera species in Massachusetts, MOVE THIS? (Insect Identification, 2006). There are many species of Entomophaga, but Entomophaga maimaiga specifically targets only Lymantria dispar. Therefore, the largest ecological effect that will be felt from the mitigation of the gypsy moth is less defoliation of forests. (Simisky, T). The two current major biological controls on Gypsy moths is E. maimaiga as well as nucleopolyhedrosis virus (NPV). The current use of NPV in the United States is by the government through using an insecticide containing NPV. The big downside to this treatment is the cost and labor. “It takes about 500 to 1000 infected caterpillars to make enough GYPCHEK to treat one acre. The amount made each year is approximately 5000 to 7000 acres worth. This is a very labor intensive and costly process”(Ohio Department of Agriculture). Also, Gypchek can not be used commercially, meaning that it is completely in the government’s control and discretion. Spreading the naturally occuring E. maimaiga would be arguably cheaper than creating the NPV virus in the lab and then releasing it. Another factor in using E. maimaiga instead of Gypchek is that E. maimaiga can affect both low and high density populations of gypsy moths, while NPV only does a significant amount of damage in high density population areas. (Ohio Department of Agriculture). In helping mitigate the defoliation caused my gypsy moths, tourism in New England would likely rise. The oak tree which is one of the gypsy moths biggest sources of food is also one of New England’s biggest tourism attractions. Mitigating the gypsy moth issue would also help to support the growth of native species to Massachusetts. According to the Associated Press fall foliage is worth upward of 3 billion dollars to New England’s economy. (Associated Press). Without oak trees New England would lose a large sum of money since tourism would drop drastically. In conclusion, the repeated application of E. maimaiga spores could offer relief to the current defoliation of plants due to gypsy moths. This would help overall forest health as well as save the native oak tree species, which in turn would benefit the tourism industry in New England. In order to do this, we propose spreading E. maimaiga using the cadaver method, which includes collecting larvae infected with E. maimaiga and placing those larvae in areas where gypsy moth defoliation is high. The spores from the dead larvae will infect the live larvae, killing them. The price of doing this would be arguably cheaper than other current biological controls in place, and likely more effective as well. Previous Article← Will Oil Drilling in the Arctic National Wildlife Refuge impact Arctic Ecosystems?